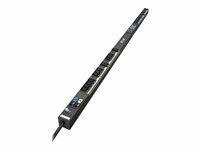 Select requirements to view suitable PDUs instantly from our entire range. 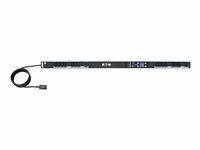 ePDU G3 Managed models allow complete lights-out control and metering of devices including devices powered across multiple ePDUs. 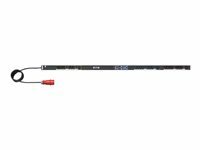 They include IEC Class 1 (±1%) billing grade accuracy, an advanced hot-swap meter with LCD pixel display showing V, W, A and kWh, and the ability to daisy chain 8 ePDUs to share the same network connection and IP address. IEC Plug Retention: Prevents accidental disconnect from being bumped or from vibration. Works with any IEC plug, no need to buy special cables or brackets. includes central advanced LCD display with menu system. Change settings incl. IP address, configure via USB stick copy / paste configuration file or configure En Masse via IPM software. Small with Flexible Mounting: Easily access hot-swappable IT equipment and components. Grouped reboot for A and B feed When connecting multiple source input servers to an A and B feed power source, the daisy-chain capability allows you to group power supplies across the ePDU. As a result, all the power supplies are controlled with a single action, which outlet switching saves time rebooting servers with two to six power supplies. Turn off unused outlets Secure and protect your environment by easily turning off unused outlets. Avoid overloading your system from others plugging in unauthorized devices. Also consider closing access with an outlet cap. Outlet grip functionality Eaton’s patent-pending IEC outlet grip secures plugs in place with a lever-actuated grip that’s integrated into each outlet. Once the levers click into the grip position, the plugs are secured from accidental disconnect due to bumps or vibrations without the need for special power cords. 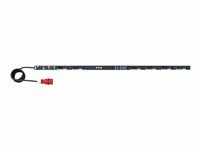 Advanced LCD pixel display with hot-swap capability Eaton’s new hot-swap eNMC (ePDU Network Management and Control) module can be replaced without the need to power down your rack. Increase uptime while enhancing serviceability and saving on unnecessary service calls. The menu-driven pixel display allows for easy setup and troubleshooting. Daisy chain four units from one IP address Eaton’s new patented daisy-chain capability allows up to four ePDUs to share the same network connection and IP address. 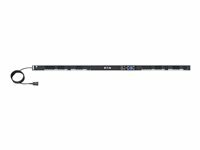 Unlike competitive rack PDUs that require a dedicated IP address for best performance, Eaton technology provides a 75-percent reduction in network infrastructure costs.